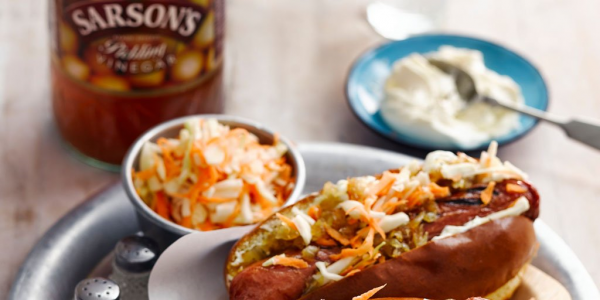 Sarson’s, the UK’s number one vinegar brand, is set to launch a new pickling campaign, combining two of the hottest food trends, street food and pickling, aimed at the younger foodie generation. Sarson’s harnessed the power of influential street food traders and food bloggers to offer inspiration as home pickling continues to re-establish its popularity in the UK*. The Sarson’s pickling project tasked the participants to create a host of recipes in their individual styles, that tap into current food trends and ‘hot’ ingredients such as barbeque pulled meats, cauliflower and courgettes. London’s ‘Street Feast’ favourites , Rainbo, Le Bab, Holy Toast, The Hip Hop Chip Shop and Kin were identified and enlisted as the street food traders for the project whilst food bloggers Ren Behan, A Glug of Oil, A Mummy Too, A Life of Geekery and Amuse Your Bouche, offering a combined readership of over 100,000, were approached to offer a home cook take on pickling as well. All the food bloggers will be showcasing the recipes on their own blogs and the street food traders will support the project on their own social channels. To accompany the campaign Sarson’s has created a number of ‘how to’ pickling videos, based on SEO data of the most popular searches around pickling. The videos feature more straightforward, searched for, recipes like pickled onions, but also cater to the more adventurous with pickled prunes and oriental vegetable’s recipes. The 15 videos, created by UM, will be promoted across Sarson’s social channels, pre-roll and YouTube. In addition, since 75 per cent of all Branston used ends up in sandwiches, the jars will also be topped by a special lid with a sandwich design. The lid provides the perfect opportunity to remind people that their sandwich will always be special by adding Branston Pickle. Mizkan Europe’s initial run of the packaging will be for four weeks, with the potential for extension. The activity is designed to be a cost effective way to encourage repeat sales. For minimal financial investment covering artwork redesign and clever printing to mix up the designs, the two new front labels aim to increase the average basket purchase from one to two jars, as consumers buy the special-edition Branston Pickle labels to enjoy the ‘Bring out (the) Branston’ humour at home. Lorna Kimberley, Marketing Manager of Mizkan Europe, said: “The post-Christmas period is a tough one for any food brand; sales are typically down and a lot of effort has to be expended in order to captivate consumers. Our ‘Bring out’ labels are a fun and novel way to engage our consumers while underlining the core ‘Make it Special’ message of the brand. Branson Pickle was bought by Mizkan Europe in February 2013 for a cash consideration of £92.5 million as part of its acquisition of Premier Foods’ sweet pickle and table sauces business. Mizkan Europe is the European subsidiary of Mizkan, a privately-owned, Japanese business started in 1804, which is the number one Sushi seasoning supplier in the world. Headed by Kazuhide Matazaemon Nakano VIII, Mizkan is a global business with over 210 years experience in producing high quality products. Mizkan Europe has continued this worldwide trend of producing high quality foodstuffs by adding Branston Pickle, Haywards Pickles and Sarson’s Vinegar to its portfolio of brands as part of its growth plan, cementing its position as pickles and chutneys, relishes and vinegar category experts in Europe. Branston, one of the UK’s best loved brands, today announces the roll-out of digital Out-of-Home advertising at Waterloo Station in time for National Sandwich Day. The ads will be featured at Waterloo Station on its new 40 meter long digital screen on 3rd November, which will run over the course of the entire day and will feature a progressive sandwich build made special by a dollop of Branston. Each ingredient is layered to create four phrases associated with the brand; “Make it Special” “Make it, Take it” “Get Making” and “Happy Making”. The launch of the ads are part of a £1.9m Branston brand campaign which runs from November through to February 2015. The ads are designed to fit into the existing brand messaging of “Make it Special, Bring out the Branston” but will also look to inspire London commuters when it comes to their lunch on-the-go, and further cement the brand’s strong affinity with sandwich making (nearly 1 in 5 consumers said Branston makes a sandwich special). The creative will be supported by on-site sampling conducted from a special Branston sandwich van. On average 1 million people come through Waterloo station a day2, and Branston is hoping to encourage these commuters to rediscover Branston pickle on their sandwiches. Branston was bought by Mizkan Euro in February 2013 as part of the company’s £92.5m acquisition of Premier Foods’ sweet pickle and table sauces business. The UK’s number one vinegar brand, Sarson’s, today launches its first major above the line campaign in ten years. The print ads, which will rotate on Fridays between the Daily Mail and Daily Express until December 12th, feature two new characters that were created by its agency mcgarrybowen and illustrated by Paul Thurlby. The brand is investing nearly a quarter of a million pounds over the next 18 months in the retro styled ads which aim to remind consumers of the joys of Fridays and its traditional fish and chip supper – harnessing the association of the meal with vinegar to create the perfect end-of-week dining experience. The campaign builds on existing PR activity aiming to remind consumers how much they love this great British brand and ties in with all ongoing activity that includes recipe development and the creation of a brand new website. Sarson’s Vinegar was bought by Mizkan Euro in July 2012, as part of the £41 million acquisition of a number of Premier Foods’ brands including Haywards pickled vegtables and Dufrais. Mizkan Euro is the European subsidiary of Mizkan, a privately-owned, Japanese business started in 1804, which is the number one Sushi seasoning and supplier in the world. Headed by Kazuhide Nakano VIII, Mizkan is a global business with over 210 years experience in producing high quality products. Mizkan Euro has continued this worldwide trend of producing high quality foodstuffs by adding Branston Pickle, Haywards Pickles and Sarson’s Vinegar to its portfolio of brands as part of its growth plan, cementing its position as pickles and chutneys, relishes and vinegar category experts in Europe. Branston, one of the UK’s best loved brands, has announced the launch of its chutney range with three delicious new flavours; Caramelised Onion, Mediterranean Tomato and Orchard Fruit. 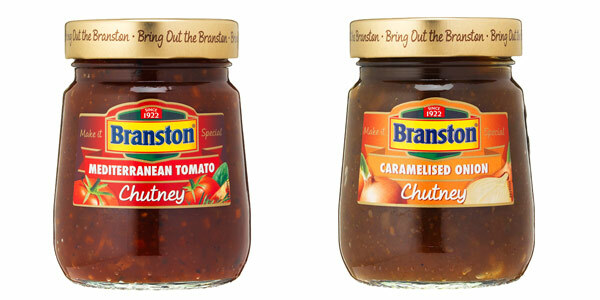 The chutney segment is in good growth (3.4% YOY1) with the traditional part of the category, where Branston will play, growing faster at 4.4% YOY1. The new label was designed by Parker Williams and the jar by Tin Horse. The jar was custom made to echo the iconic Branston Pickle shape and is smaller (290g) in order to drive penetration with consumers. The back of pack serving suggestions aim to educate and inspire users to explore new tastes with their food. Currently, traditional chutney penetration stands at 20.7%3 and Branston market research suggests that it will be seen as a beacon brand in this new segment as it has high pickle brand awareness (88%4), which allows the brand to launch into this arena. Roll out of the chutneys is being supported through a £1.9m TV ad campaign designed to inspire purchase of chutney during the Autumn and Winter seasons and in the run up to Christmas. All media activity was planned and executed by UM London. All creative was designed by mcgarrybowen.